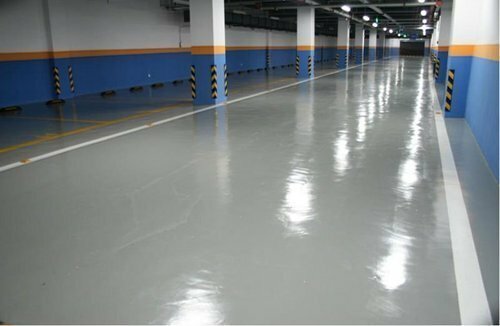 Self leveling high performance glossy top coat based on epoxy resin reinforced with aggregates and is available in assorted shades for application on concrete floors, on existing floor coated prepared areas for recoating purposes. Recommended for industries like chemical, pharmaceutical, clean rooms, food processing areas, laboratories, demonstration and training rooms, tool rooms, electrical and electronics assembly plants, packing and storage areas, automobiles show rooms, production areas, car parks etc. Established in 1994, Ashok Paint Agencies is supplying, wholesaling, distributor and trading a range of Paints & Thinners. The range of products we offer include Asian Paints, Berger Paints and Akzo Nobel Paints, among a host of other popular brands. Our products find their extensive application for decorative finish of various establishments, coating of wood & metal products, construction equipment, engineering and automotive parts. Our vendors, who hold a reputed name in the market, utilize accurate blend of optimum grade ingredients to formulate the range of offered products. Our Product Line is appreciated in the market for characteristics such as Eco-friendliness, optimum coverage, resistance against moisture, heat, chemical and corrosion, high gloss and smooth finishing. Some of the other leading brands we deal in are Asian Paints, Berger Paints Akzo Nobel and Shalimar Paints. Our manufacturers and vendors operate out of a state-of-the-art infrastructure unit, equipped with latest processing machines and tools. Our entire operation, from raw material procurement to manufacturing, is carefully overseen by dedicated quality control officers. This is why we have amassed a vast clientele. Since our products are supplied traded and wholesaled across the country, we have set up an efficient transportation system.